Replies: 466 (Who? ), Viewed: 214142 times. At this moment it appears to be mainly affecting objects with slot resources in the package - tables, kitchens, sofas, cars etc. We do not wish to be alarmist, but we recommend that you delay patching until the full extent of the impact is known. If you do wish to patch or play with Pets, we recommend that you backup your save files first and play with a new town, to avoid any problems caused by loading towns which already contain broken CC objects. Installing the Pets Expansion will also install this patch. Update: Creators, please see the full thread (click the news item title) for a fix. Update 2: Pending a public release of a batch fixer, we now have a tutorial on manually fixing affected objects (it's not really long and complicated, it just has loads of pictures): Tutorial:Fixing Object RIGs for 1.26. Update 4: There is now an early beta of an automated tool to fix this problem, created by granthes and available here. Remember that this is a test version, and you should always backup your .package files before using this tool on them! Last edited by whiterider : 19th Oct 2011 at 9:45 AM. 68 users say thanks for this. 2) Clone it again in S3OC with Renumber box NOT ticked. 4) Open your broken cc package in S3PE and then open the VPXY in Grid. 5) Go into Chunk Entries, Chunk Entries, RCOL BLock, TGI Blocks and open the TGI entry that matches the number of your custom _RIG that is already in the package. Edit it to be the same as the original _RIG you made a note of. Save and test. NB if you actually edited your RIG, then this method will lose your edits. In that case you may like to actually import the EA rig to your package and renumber it to match your original cloned RIG. Then once the tools are updated to handle it, you can edit it again. This might be a good point at which to link to our rules on uploading fixes of abandoned CC. Unfortunately it sounds like in most cases the creator themselves will have to do the fixing, as the correct _RIG is required (I assume? ); however in some cases it is possible to work out what the creator cloned by examining the package contents, and so some abandoned content may be fixed by third parties. Is this fix required if you made the objects in TSRW - and if so, how are the steps different? The object set I made was done in TSRW - I'm not planning on updating until I actually get the EP unless I need to do so to fix my CC. Oh yes, it's affected all the CC at TSR as well. The only CC that is not broken is stuff they made in the first couple of months of WS being released, when it didn't pull the RIG into the package. Or of course stuff that doesn't really use the RIG for anything obvious such as deco items. Edit: Imma wait till Delphy has a chance to look at the documentation on the old format vs. the next, as it may be possible to do an auto-fixity thing that doesn't require a full reclone. Maybe. Possibly. Perhaps. Clothing and hair should be safe, right ? The build mode stuff will be affected too, but as with anything, how much you'll notice the problem will be related to the way it is used in the game. Things where you don't really interact with them will probably go on working just as they always did. The game tolerates old-format RIGs, it's just the interactions and placing objects into slots that expect the new format. We're not in blue-lot territory here, there is no evidence it's a game-breaker to have unfixed CC. 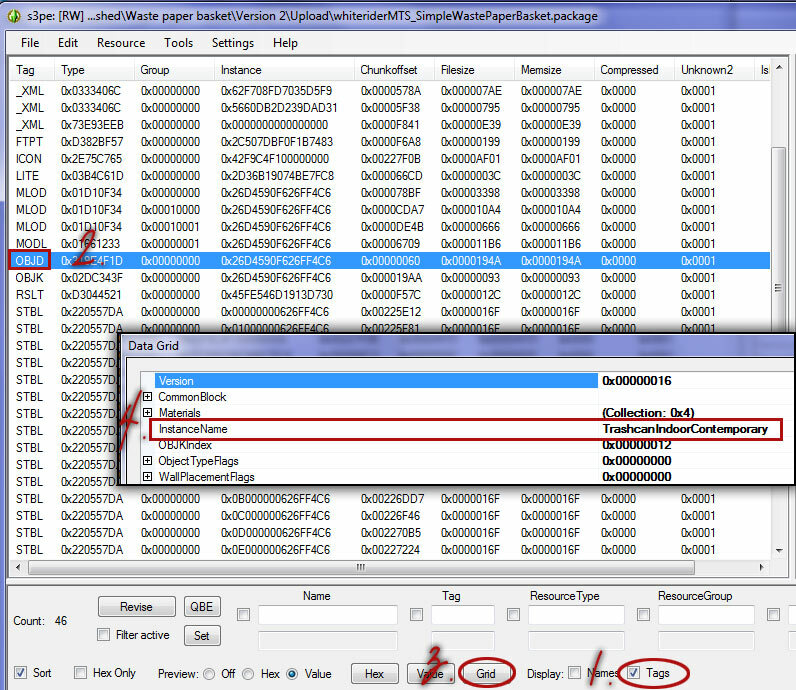 is it just .package files or sims3packs too? Does it matter? If it's just .package files I can deal with out that CC, but not my sims3packs. PM me with a request! It's everything that has a _RIG - so both package and sims3pack. It's apparently also a problem with poses too. Does EA store content not work either then? I have no idea what an _RIG is so sorry for the questions haha! EA released a patch for Store content a few days ago. Other than the one the had on 09/12/11 ? I've only seen one store patch so far. There's supposed to have been one a few days ago - I haven't patched anything myself in ages so I dunno for sure, but I saw some info around about it. Apparently the Store patch was one of these things that pops up annoyingly in-game and bugs the hell out of you 'til you block it in your firewall. 1. Open your file in S3PE and make sure Tags is ticked. 2. Find the OBJD resource. 4. Check Instance Name for the name of the item your item was cloned from. This breaks anything that uses a _RIG to create it. Any object that a sim interacts with... any object with an animation associated with it. Any one-frame animations (which are what poses are). Can we assume that deco objects are not affected, since sims don't interact with them? Clothing, makeup, shoes, hairs... all that stuff is okay, since sims don't interact with them? This message has been deleted by ninfadistella. This complicates my first mesh set considerably, thank goodness I only have the table done and thank you for the work around Inge. Last edited by Deestar : 17th Oct 2011 at 9:52 PM. Out of mere curiosity, what is it then that makes store stuff different from 3rd party content? The only store patch is really the one from 09/12 that crinrict mentioned, that's more than a month ago. Shouldn't that have made patched store stuff unusable while 1.24 was still the current patch? And shouldn't such a patch not have changed every single item in the DCCache, while items having been added afterwards should then be unpatched? There would be no need for the Store patch to change everything in the DCCache: to convert the _RIGs as it found them would be way too much hassle when you can just replace or override _RIGs with given Instance numbers. The only difference is that the Store stuff has evidently been updated, while CC stuff hasn't. We should have a tutorial on fixing objects manually up, complete with pictures, tomorrow afternoon at the latest. Can you only manually fix items you created, or can you manually fix items which someone else made (who maybe doesn't even create for TS3 any longer)? You can manually fix other people's stuff, using Inge's method and the information in my post earlier. I just tested a stack of CC doors (different creators), the animations is broken on all of them - the sims just walk though them.